Food Star of the Month!! And the winner is…………………..
Parsnips are at their best in January and February and can be used to create some fantastic dishes! They should be firm and dry but tend to have a tough, woody core the larger they are.Flavour and sweetness are increased by frost, so the colder the winter months are, the better these delicious root vegetables should be! In Italy pigs breed for top quality Parma Ham are often fed on a diet of parsnips. Deep-frying these fritters gives them the nutty caramel amber edges so recognisable when roasting the white roots. Not difficult to make, they are the perfect warm snack and the blue cheese and walnut whip is the perfect dip for them. A selection of blue cheeses can be used, but my favourite is the Irish cow’s milk Cashel Blue, made in roughly the same way as Roquefort, but with a slightly softer texture and less salty finish. The whip is put together with mayonnaise, lime juice, double cream and walnuts. Quarter the parsnips lengthwise and remove the central woody core. Cook in boiling salted water until completely tender, then drain. 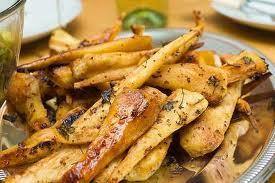 Place the parsnips back in the saucepan and stir over a low heat, allowing them to dry. Then purée with a potato masher for a coarse finish or blitz until smooth in a food processor. Rinse the chopped onion in a sieve, dry it and add to the parsnips along with the eggs and butter. Add the flour, beating it in well. Season with salt and pepper. While the parsnips are cooking, make the whip. Whisk the cheese into the mayonnaise, breaking it down until reasonably smooth. Add the lime juice and walnuts, and season with a pinch of cayenne pepper. Lightly whip the cream into soft peaks, then gently fold it in to achieve the required whipped consistency. It can now be chilled for a firmer consistency or served at room temperature for the creamiest of finishes. Preheat the oil for deep-frying to between 160o°/325oF and 180°C/350°F. The parsnip mix can literally just be spooned into the hot fat (oiling a spoon first helps create a non-stick effect). Turn the fritters from time to time, until a deep golden brown. Once they are cooked, remove them from the hot fat, drain on kitchen paper and lightly salt. The fritters and walnut whip are now ready to be enjoyed.